by H.-J. KÜNNE. Published in Papageien 2/90. One of the most thrilling members of the parrot family worldwide for me is the Hyacinthine Macaw. If I was already much impressed by the behaviour and appearance of other macaws, then this blue macaw exceeds its relatives in many respects. It is in my opinion one of the most intelligent parrots, if not the most intelligent and I should like to pass on my observations and experiences of the Hyacinthine Macaw below. 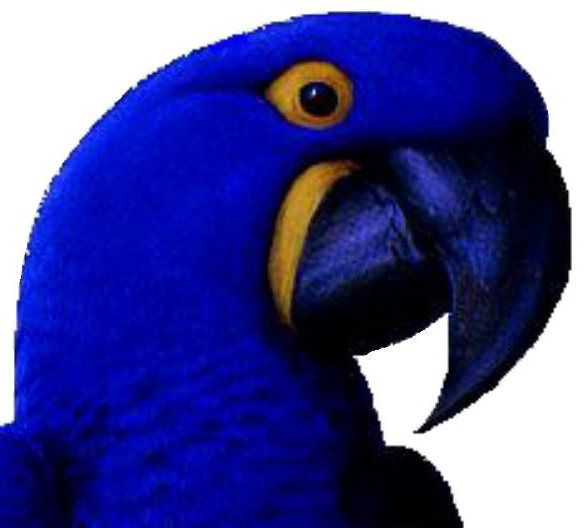 In autumn 1987 I acquired a male Hyacinthine Macaw from a breeder, which had been kept together with another male. It seemed healthy, but the plumage was not in very good condition. Some of the feathers were not the normal luminous blue, but were black. Occasionally black feathers are cited as a determinant for the age of the bird, in other words black means it's a young macaw, but this cannot be correct. It is surely a sign there is something wrong with the structure of the feathers. The normal colouring is not recognisable and the feathers appear to be black. I have often noticed a similar condition with Amazons after quarantine. The cramped conditions affects the plumage so badly that it is damaged and some feathers appear to be black.. After the first moult, however, these feathers regain their usual colouration. And so it was with my Hyacinthine Macaw. A short time later I acquired a female. She had been kept alone in an aviary because no male was available. I put both macaws together without preliminaries. They did not bite one another, but for the first four weeks they barely tolerated each other. Then suddenly they began to reduce the distance between themselves and finally sat close together. From now on I was able to observe constant mutual preening. Although the male dominated until the first eggs were laid - he was always the first to the food bowl and ate the most nuts - they now harmonised splendidly. While the female was very shy and always kept her distance from me, the male took nuts from my hand. This enabled me to recognise differences in behaviour compared to my other macaws. While other macaw species only held one nut with the foot and feed, the Hyacinthine macaws were able to hold several at the same time. They can hold a nut in one foot, sit on the tarsus and use the other foot to pass another nut to the bill. They can even manage three nuts at once by holding a nut in each foot and biting the third open in their bill. The pieces they bite off they pass to the gullet with the tongue (see also Müller-Bierl 1988). If a larger piece of nut threatens to fall on the floor, they hold it tight between bill and foot. It amazes me that they are able to perch securely without holding on with their feet. This " hoarding " of nuts may be instinctive behaviour. Why only Hyacinthine Macaws should display this behaviour is not quite clear to me. Perhaps the competition in the family groups in the wild is so great that this " hoarding " is necessary to get sufficient food. Since the first breeding however I have not observed this any more. The male also no longer seems to be dominant. In contrast to my other macaws the Hyacinthine Macaws go down on the floor very frequently. They investigate everything lying around and dig around with the bill. They like picking up stones of up to 3 cm (1 inch) in diameter. They fly up to a branch and holding a small twig and the stone in the bill proceed to chew on both.just like they do when cracking palm nuts (Hohenstein 1987). In Spring 1988 the Hyacinthine Macaws were put in a larger enclosure with an inside area of 2 x 3 metres (6 x 9 ft) and an outside area of 3 x 6 metres (9 x 18 ft). In the inside area there were two nestboxes measuring 80 x 50 x 50 cm (30 x 20 x 20 ins) made of 4 cm (1.5 ins) thick beechwood planks. Whilst one was positioned horizontally just under the roof, the other was placed again horizontally, but 1.20 m (4 feet) from the ground. The horizontal position is I believe advantageous because the nesting material is usually in the back part. If the macaws are disturbed when breeding, they come to the entrance hole and do not trample the eggs. Equally the eggs are not so easily damaged by the adults rushing into the nestbox. The inside area is lit for 16 hours each day during the breeding period, otherwise it is shortened to 9 hours. The nestbox is removed when the macaws are not breeding. Before describing their diet I should like to mention that in my opinion it is one of the decisive factors for successful breeding. It should be as varied as possible. Seed is mainly provided sprouted during the breeding period. If young are being reared, then I offer it unsprouted as well. I also provide fruit (apple, pear, cherries, plums, banana, orange etc. ), berries (rosehip, red and black elder, rowan) and vegetables (cucumber, onion, carrot, courgette, sweet pepper, etc.) either fresh or defrosted. Half-ripe, deep frozen maize is much enjoyed by macaws. I therefore feed half a cob each to my macaws once or twice a week. It is all mixed in a large feeding bowl and sprinkled with a soft food mix, calcium and mineral supplements. Then they receive some dog biscuit as well as nuts (brazil, walnuts, hazel and pine-nuts) and occasionally dried shrimp. In addition I feed them meat in the form of cooked chicken bones and chop bones with meat remains. This is enjoyed almost as much as nuts. In winter during the resting period I provide no sprouted food. I also feed them less fruit and vegetables. I place calcium in the form of pigeon grit in a second bowl. This is usually taken up by the Hyacinthine Macaws very quickly. In addition I occasionally offer charcoal obtained by burning thicker perch material. The floor of the ouside area is partly earth with grasses and other edible vegetation. I have sometimes seen my macaws eating soil, which may be for meeting mineral needs. Fresh willow branches are always available and are regularly chewed. In 1988 hardly anything occurred in the first half of the year. The pair harmonised beautifully, but paid virtually no attention to the nestboxes. The initially very shy female slowly became more confiding. In the second half of the year the pair appeared to come into breeding condition. Occasionally the female was fed by the male. In September the Hyacinhtine macaws were copulating regularly, but still showed no great interest in the nestboxes. I therefore placed a hollowed out fir tree stump 1.2 m high with approx. 40 cm diameter (4 ft with 15 ins diameter) in the outside area, but this was ignored as well. From October the copulating ceased and was not observed any more throughout the entire winter. At the beginning of April I reinstalled the two nestboxes in the inside area and extended the light period as well as altered the diet. Soon the pair were feeding each other and began copulating again. During copulation the macaws made constant noise so that I knew when they were copulating without seeing them - the pair were in the inside area, where they were often to be found. If they were interrupted, they stopped immediately and became threatening. As neither macaw showed any increased interest in either of the nestboxes, I began to suspect they might be two males. The male had also fed his male companion when with the previous owner. Therefore I had the alleged female endoscoped as the male had already been sexed immediately after acquisition. This however confirmed she was a mature female. The visible gender characteristics described by Winkle in 1987, namely that females have a bare strip on their abdomen, also applied to my pair. It still needs to be proven with all Hyacinthine Macaws. One of my Blue and Yellow Macaws (Ara ararauna) also had a bare strip to the abdomen even though it was a confirmed male. From the day of the endoscopy my Hyacinthine macaws strangely started showing a strong interest in the nestboxes. Both birds became more aggressive towards me. At the beginning of May I tried out a little experiment. I placed an infertile egg from my Green-winged Macaws (Ara chloroptera) in each of the nestboxes. The male became very excited after he discovered one of the eggs. He stayed for a long time inside the nestbox and I had the impression he wanted to entice the female into the box. However she showed no interest in the eggs. Two days later the male quietened down again and the next day both eggs were broken. Up to this point in time they were only given as much food as they usually ate. I remembered the information that some parrot species begin breeding when the food available changes or increases. From 20.5.89 I tried feeding much more to my pair than they could eat. In addition I doubled the daily ration of brazil nuts (8 per day). The female then started to stay more frequently in the nestbox positioned half-way up. Nonetheless I did not believe she would lay. On 24.5.89 the male sat alone in the outside area and the female did not leave the nestbox. To my amazement I discovered the first egg in the evening when inspecting the nextbox. Exactly four weeks had passed since the endoscopy. Four days later on 28.5.89 the second egg was laid. This proved to be fertile when inspected on 1.6.89. At regular intervals I moistened the nest material - decaying wood broken down by the macaws - and the layer of sand on the floor of the inside area to increase the humidity in the area as much as possible. For the first time I observed that the Hyacinthine Macaws pressed against each other when I approached and brought their rumps together just as in copulating. The sounds were also similar to those in copulation. However the fact that it was not genuine was clear from the pauses or short periods of activity. As soon as I moved away the birds calmed down again. I would describe this behaviour as pretend copulation, but have no idea what purpose it serves. It is possible it may assist a pair in asserting their togetherness when threatened by another pair or predator. It is questionable whether Hyacinthine Macaws in the wild exhibit this behaviour or whether it only occurs in birds held in aviculture. I only ever observed it in my Hyacinthine Macaws and not my other macaws. The macaws grew more aggressive as the incubation period progressed and inspection became more difficult. The male sat in the entrance of the nestbox and stayed there sometimes for hours. At the end of the incubation period I opened up the eggs. The first was infertile as expected, but the second had a fully developed chick, which had died just before hatching. Only the yolk had not been absorbed. A few days later the Hyacinthine Macaws began to visit both nestboxes and after a while seemed to decide on the one positioned higher. As the breeding activity again began to increase, I added vitamin B to the food to enhance the hatchability of the young. From 15.7.89 the female suddenly began to stay in the lower of the nestboxes. A day later she laid the first egg (22 days after the removal of the first clutch). Four days later the second egg was laid. The female seldom left the nestbox during the entire incubation period. On 1.8.89 I managed to entice the macaws out of the nestbox for the first time with brazil nuts and inspect the clutch. Both eggs were fertile! Finally I moistened the nest material well. On 9.8.89 I succeeded in shining a torch into the nestbox although both adults were inside. I saw that one egg was pipped. It was not until three days later that it hatched. Even before hatching the young bird could be heard loudly peeping. For two days before and one day after the Hyacinthine Macaws hardly ate. I assume that the small amount of food in the crop had to be really well pre-digested to provide the right consistency for the young. The young macaw was well fed from the first day. I did not see any excited behaviour by the male during hatching as reported by other authors (Winkle 1987). On the morning of 14th August the second egg had pipped and the young macaw hatched two days later on 16th August. The incubation time for both eggs was 27 days. Other authors give a period of 28 or more days (Low 1983, Bonifer 1985, Volkmer 1985, Winkle 1987). I inspected the young every day for the first few weeks. They were occasionally smeared with food as was the nest material around them. Probably the adults have to learn how to do this correctly. If you look at the large bill of the adult Hyacinthine Macaw and compare it to the tiny bills of the young, you wonder how on earth they manage to feed them. In the first weeks the adults remained in the nestbox for long periods. I could not establish whether both fed the young or only the female. At 14 days the first hatchling threw itself on its back and kicked its feet wildly when I carried out an inspection while the adults were in the outside area. I wanted to take the young macaw out of the nestbox and came into contact with its claws. These were exceedingly sharp and caused deep scratches on my hand. I assume that even at two weeks the young try to deter predators. Throughout the entire fledging period they would throw themselves on their backs if they were alone in the nestbox during an inspection. If however the parents were in the nestbox they remained quietly sitting. Although I was certain the rearing of the young would not be disturbed by my presence, I decided not to place closed rings on them in the interest of their welfare. I believe occasional disturbance promotes their readiness to defend themselves and also breeding. This will not apply to all pairs. The macaws must be fairly tame, who do not retreat when the aviary is entered, but attack the intruder. This was the case with my macaws. Therefore I did not hesitate to remove the young regularly from the nextbox to weigh them, and monitor their development. Unfortunately the young could not usually be weighed with empty crops. This has to be taken into account when drawing a weight curve as a full crop can make a difference of 50 to 80 g to the weight and thus affect the results. At three and a half weeks I gained the impression by comparisons with photographs of other breeders (Lafin 1986, Volkemer 1985) that the young were not growing properly. Therefore I gave them vitamins (Vitacombex, Korvimin) direct into the bill. In hindsight I am not at all certain that the young really were growing too slowly. In situations where young do not appear to be developing normally, many breeders tend to over react as I did. The young developed from this point really well as you can see from the photos. At around 32 days the wing and tail feathers broke through and a few days later the first feathers on the head. The adults roosted outside the nestbox again. At around 60 days the bare area on the face slowly turned yellow. By this time the head and wing coverts were already fully feathered whilst the breast, abdomen and back were still bare. The first aggressive behaviour was observed as the younger of the two was 64 days old. It seemed to be disturbed by the beam of the torch and went for me at first, then the older sibling, which it bit in the head and wing. The younger macaw seemed more aggressive. At 74 days the older one tried to climb out of the nextbox for the first time. A week later (81 days) it was found sitting on the box. As it was still not completely feathered on its breast, abdomen and back I put it back in the box. 6 days later it was sitting once again on the box. Every time I tried to put it back in, it climbed out again immediately. Only once did I find it sitting on the floor. I laid a thick layer of shavings on the floor of the inside area to avoid injury. From now on it remained sitting on the top of the nestbox. I do not believe that this is normal. A few other species of birds are supposed to leave the nest early, but a young Hyacinthine Macaw falling from the nest in the wild would not survive long. Some parakeet breeders allege that their young leave the nest early if they are not well fed, but this could scarcely apply to my Hyacinthine Macaws as they always had full crops. Perhaps premature leaving of the nest is peculiar to some species, as for instance when other authors established a longer fledging period (Bonifer 1985, Winkle 1987). On 9.11.89 I twice observed the adult male feeding the young macaw on the nestbox. After that it disappeared into the nestbox and fed the second young macaw. This twice daily feeding continued even after the younger one left the nestbox. If the first begged for more food, it was pushed aside and its younger sibling fed. By this means all the young are well provided for and not preferred by aggressive jostling. At 90 days the second young macaw left the nestbox. At 95 and 99 days respectively the young began to climb around on the perch. Beating of the wings to strengthen flight muscles after leaving the nestbox was regularly observed. A few days later they flew with the adults into the outside flight and back again into the inner area. I had already placed nuts and pieces of frozen corn on top of the nestbox. They played around with them enthusiastically and even ate some of the maize. Very soon they were trying to feed themselves from the food bowls. In mid-November I discovered a small growth on the eye of the adult male. Dr. Busche, my veterinarian in Heuchelheim, recommended the daily application of an ointment to the eye. If it did not disappear after a few days, an operation might be necessary. But treating the eye would have entailed catching up the adult male every day and I felt this inappropriate whilst the young were still with the adults. I therefore postponed any treatment and the growth disappeared by itself after two weeks as suddenly as it had appeared. The adult pair continued to be aggressive towards me. It was noticeable that they seemed to defend the nestbox more than the young. When I entered they rushed into the box leaving the young sitting on the perch. This remained so until the young were independent. They continued to indulge in fake copulation. If one of the adults was outside at the time it would try " copulating " with one of the young. At around 6 months both young were able to feed themselves, but I left them with the adults for a few more weeks. They were only slightly different from the adults in appearance. They were still somewhat smaller, the yellow around the mandible was not so intense and the plumage not so bright. A surer sign of youth seems to be the colour of the stripe on the tongue. In my young this is greyish-black instead of yellow. One of them had a bare patch on the abdomen and therefore could be female if this is truly a characteristic. Finally I should like to refer briefly to the yellow skin around the bill of Hyacinthine Macaws. Occasionally one reads (Robiller 1982, Lantermann 1985) that this area of bare skin changes from orange-yellow to pale yellow in the female when she comes into breeding condition. This was not the case with my pair. The male even had paler cheeks than the female. The colour is probably dependent on the condition of the macaws. Sick birds generally have paler skin. It is also possible that Hyacinthine Macaws from differing areas in the wild have colour variation. This would be very difficult to prove as birds were often sent far away in South America before shipment to Europe. Therefore the exact origin is not likely to be known. The claim (Lantermann 1985) that it becomes paler when breeding for camouflage reasons I find improbable if only because pale yellow is often more conspicuous than a darker yellow. In addition the gender of the macaw needs to be known before drawing any conclusions. Surely the colour of the cheeks and tongue has a signalling purpose, but very little is known about this. For sure many questions about the behaviour and habits of the Hyacinthine Macaw are still not answered. Every breeder has the opportunity to contribute to the answering of these questions. It is only important to observe and share experiences.